This week in Little Star Weekly we feature a poem from the Persian of Sohrab Sepehri. Tonight I will say farewell. but don’t understand what they are talking about. Sohrab Sepehri was born in 1928 in Kashan, Iran, and was trained as a painter. In the mid-sixties he resigned a government position in travelled extensively in China, Japan, and India, developing a deep interest in Buddhism and Hindu philosophy, and devoting himself thereafter to painting and poetry. This encounter with eastern meditative traditions converged in his work with an affinity for mystical Sufism. 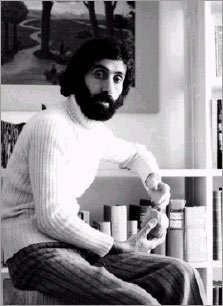 He followed Nima Youshij, Ahmad Shamlou, and other poets of the time in moving away from traditional Iranian forms toward an unrhymed, unmetered “New Poetry,” which departed from the courtly traditions of Persian verse, embraced colloquial language and everyday experience, and conversed with European modernism. The result was a deeply personal, meditative verse that was disdained by the leftist intellectuals of his own generation but has been rediscovered by young contemporary Iranians seeking more personal freedoms and rejecting dogmatic authoritarianism. His work shares with the Buddhist poetry of China and Japan an attentive stillness and reverence for the natural world. Boa Editions recently brought out a selected poems, The Oasis of the Now, translated by Kazim Ali and Mohammad Jafar Mahallati. In Sepehri’s lovely poem, “Calling for You,” the speaker harkens to a call that is at once a summons to earthly and inner travel. This entry was posted in News and tagged Iran, Poetry. Bookmark the permalink. Follow any comments here with the RSS feed for this post. Both comments and trackbacks are currently closed.